When a project runs in a production environment and multiple deployments have been made, it is important to review and analyze the new packages to make sure that the package to deploy is correct. It is also important to check what is going to be deployed before generating the file, that is, whether you want to deploy a project for the first time, perform a deployment for improvement of a project or explore a deployment package. Bizagi knows this and provides an interface called Package Visualizer. Through this section, we describe how it can be used, the information it provides, and some other important details. When can you use it? 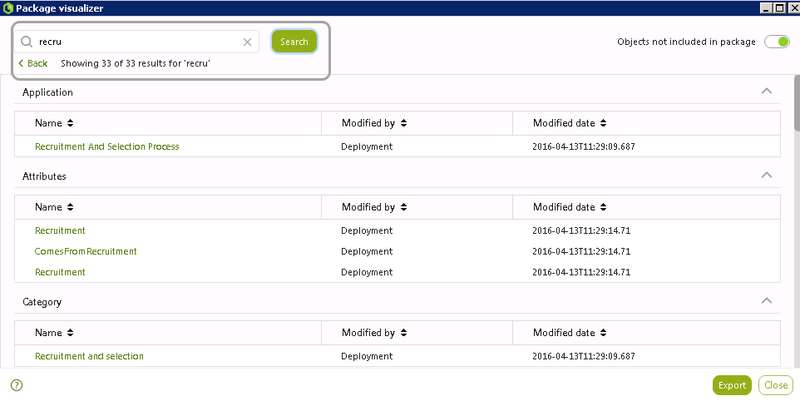 •One click deployment: in the last step of a deployment process, you see the View exported objects button. 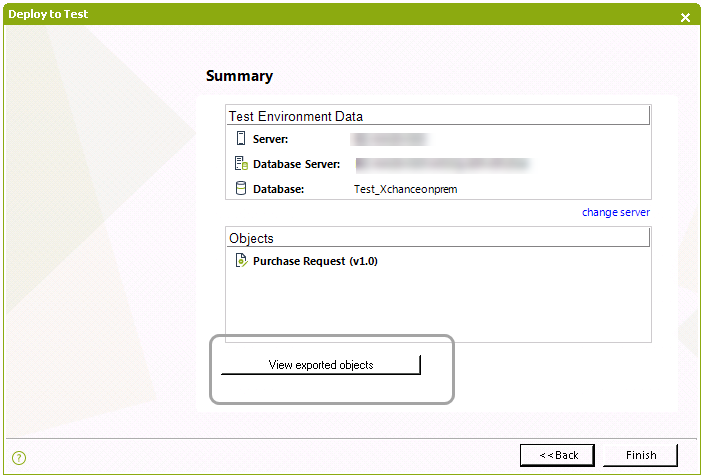 When you click it, the Package Visualizer shows the objects that will be deployed to the selected environment. •Importing a .bex file using the Management Console: in Management Console, it is available an option to explore the .bex file in the file menu in the main ribbon. 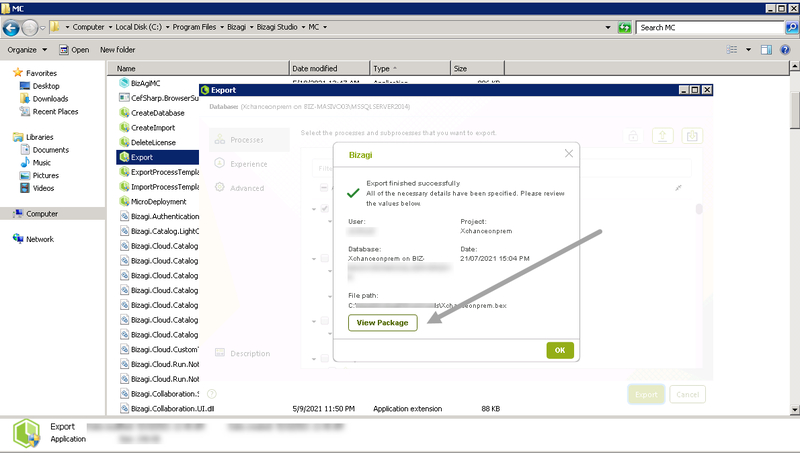 When you click it, the Package Visualizer shows the objects in the .bex file when the deployment was generated. 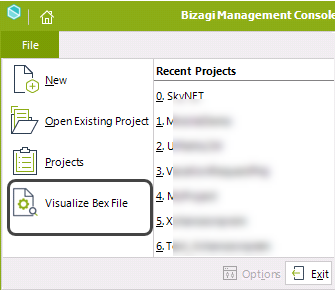 •Importing a .bex file using the Bizagi Studio: is available an option to explore the .bex file in the file menu in the main ribbon to visualize a .bex file. 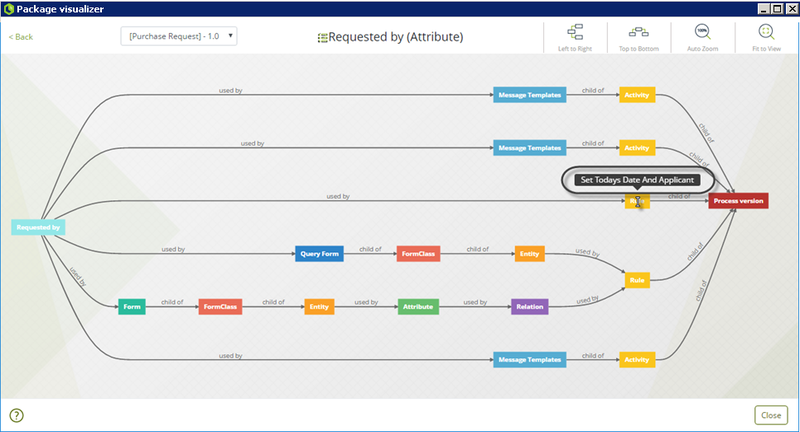 The Package Visualizer lets you graphically explore and analyze all the components and objects taken into account in a deployment. However, it does not let you change, add or delete any information, components and objects. 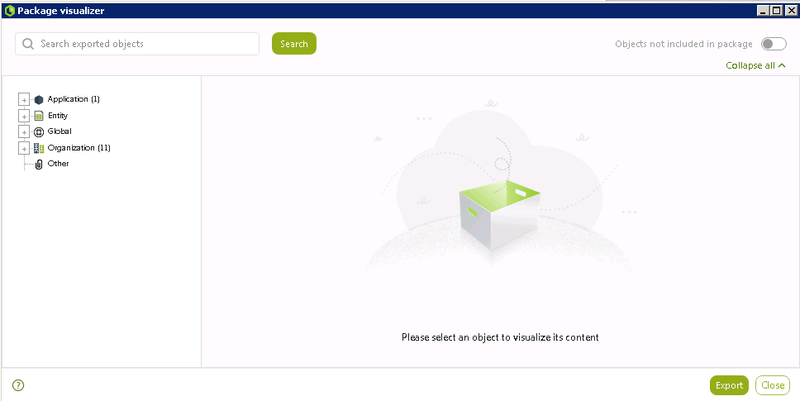 In this part of the article, we describe the details of the features which are available when launching the Package Visualizer either from any of the three options mentioned before. 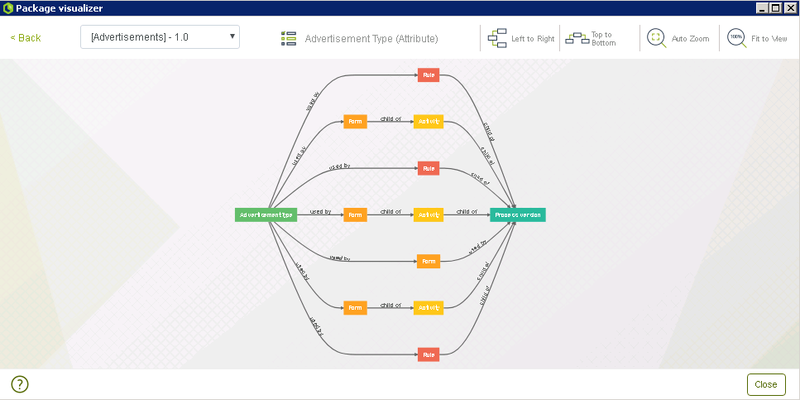 The Context View shows the members of the selected node in the Tree View. When a selected node has subcategories, the Context View shows tables containing the information of the elements of every subcategory. In this table, you can see the name of the object, the last person who modified it, and the last modification date. When you select a node from the Tree View, the Context View shows the context path in the title and several tables with the objects of the node grouped by the type of element. Each element in the table shows its name, the last person who modified and the date of the last modification for each attribute. When you move to the Search tab, a search bar appears so you can input object names or query for people (those who modified the objects). The search results are grouped by the type of object, and can be collapsed or sorted (on an ascending or descending fashion) by any of the columns. To collapse a group, click the icon shown next to the group's title. To sort a table by a column, click the column's name to cycle between ascending, descending. When you select a node from the Tree View, you can click the element name to display the dependency viewer. 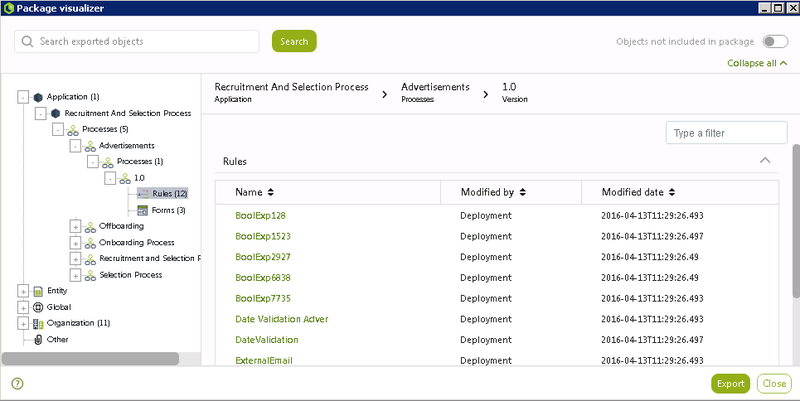 The dependency viewer lets you identify the elements involved in the deployment package and the relation between them. 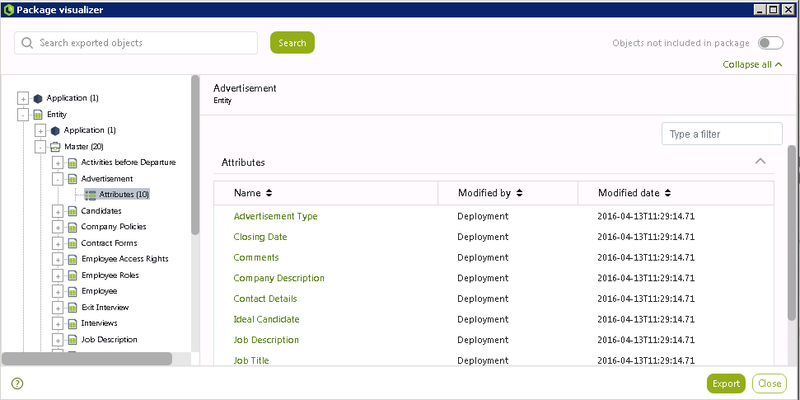 Once you select the element, the Dependencies view shows you a map with the information of the elements which have a relation with the selected element. An element can be used by several objects in the deployment packages and can have several dependencies. To change the object where the dependencies are analyzed, select the object from the drop-down list displayed at the top of the view. Hover the mouse pointer over any of the elements of the map to show its name. You have the following options available when using the dependency viewer. 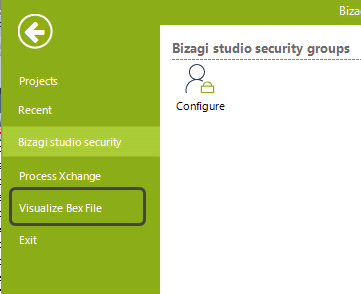 •With the package visualizer you can explore .bex files generated using a version of Bizagi higher than or equal to 11.0. •Some of the files generated in Bizagi 11.0 may show an error when trying to visualize it. This error may also occur when the .bex file has problems with its metadata. 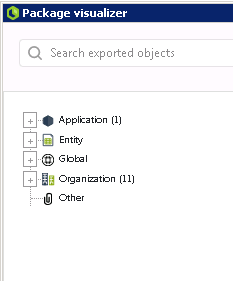 •Advanced deployment: In Export, you see the View exported objects button inside the Tasks for package section. When you click it, the Package Visualizer shows the objects that will be deployed to the selected environment. It is not available a Save option since the .bex file is not editable when you navigate the objects to be deployed using the Package Visualizer.